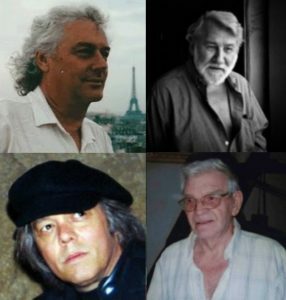 The Legends Series: The Four Warren Legends responsible for the Pie: (Top) Bill Dubay, Alex Toth; (Bottom): Budd Lewis, Luis Bermejo. If—as a civilization—we haven’t yet destroyed ourselves four hundred years from now, will any of the media of today be remembered as “classic,” classic meaning something worth remembering due to its quality and what it has to say about the human condition? Of the thousands of movies, television series, books, magazines, and plays, what will still remain, still stand out, still be watched or read? Moreover, what of the medium of comic books? Will any of the stories and series still be read and remembered? No doubt every reader has his or her favorites, even if others may not agree. We at Top Hat have our own thoughts on the matter (even if no one else agrees!). 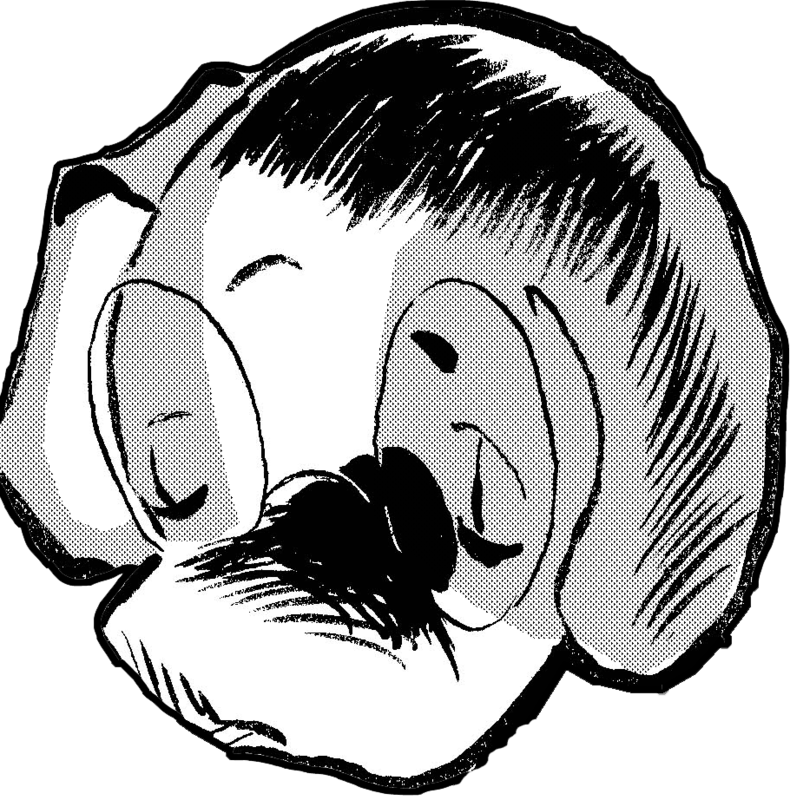 Last week, we set out to identify five comic stories/series that may very well be remembered and valued as classic in the centuries to come, even if they were not appreciated in their day. Our first selection was Marvel’s The Tomb of Dracula. This week we turn to a Marvel competitor, a competitor which—in our view, at least!—should still be in business: Warren Publishing, creators of the Famous Monsters of Filmland, Vampirella, Creepy, and Eerie magazines. 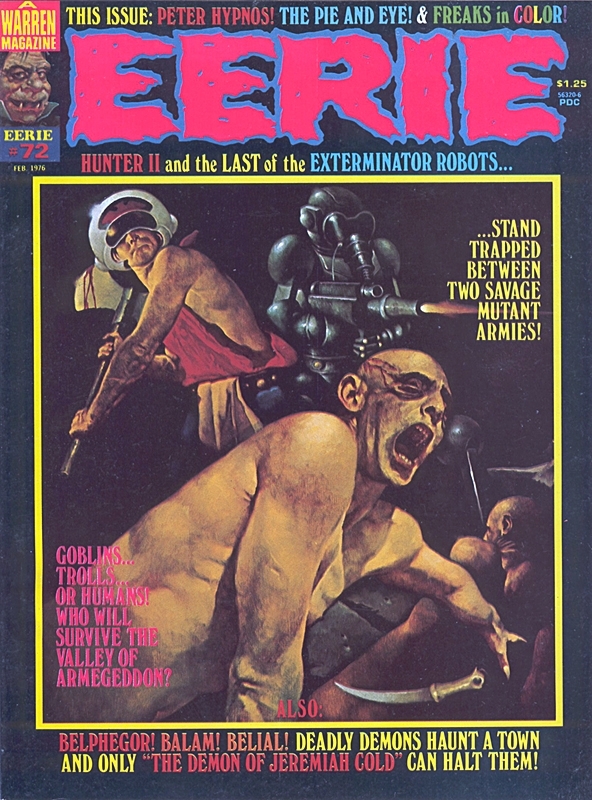 Sadly, Warren, which started up in 1957, went out of business in 1983, but in those years the company published some of the best and most memorable horror, Sci-Fi, and fantasy to be found—anywhere! One of the many classic stories which Warren published was that of Pie, first in “Daddy and the Pie,” in Eerie #64 (Mar. 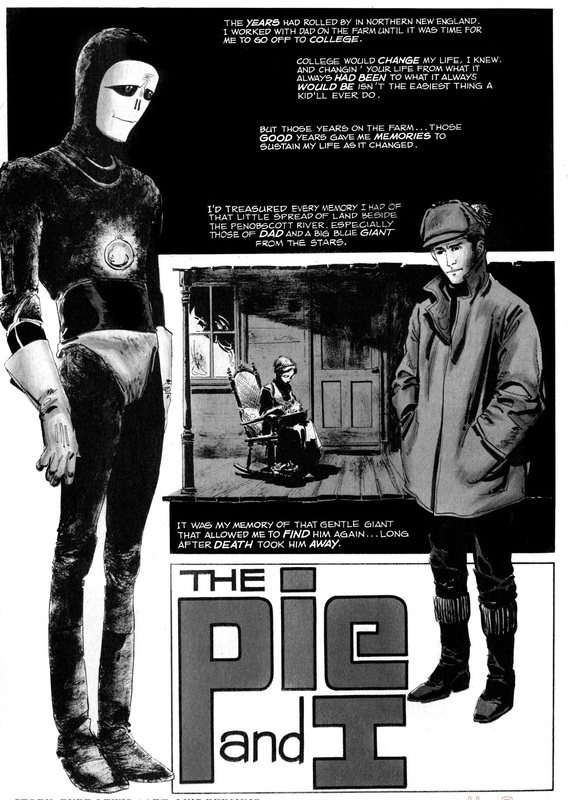 1975), and then “The Pie and I,” in Eerie #72 (Feb 1976). In our view, both were pieces of classic comic literature, due to what these two stories have to say about the idea of mercy, tolerance, power, and forgiveness, as well as on the nature of alien life, if it exists. “Daddy and the Pie”; Page 1: The Harris Family first meet Pie when they rescue him from the wreckage of his spaceship. Pie’s story began in Eerie #64 (Mar. 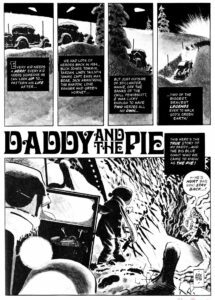 1975) in “Daddy and the Pie,” written by Bill Dubay with art by the legendary Alex Toth. 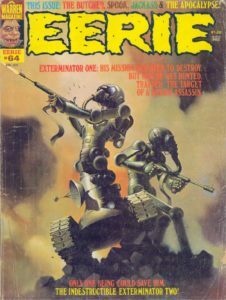 Dubay had taken over editing for Eerie in 1973 after the departure of Archie Goodwin. Under Dubay, the magazine began to introduce more series and brought in Spanish artists from the Selecciones Ilustradasto agency to add variety to the American artists at the company. In “Daddy and the Pie,” “The Pie” was a giant blue alien whose ship had crash-landed in northern Maine near the Penobscot River in 1934. 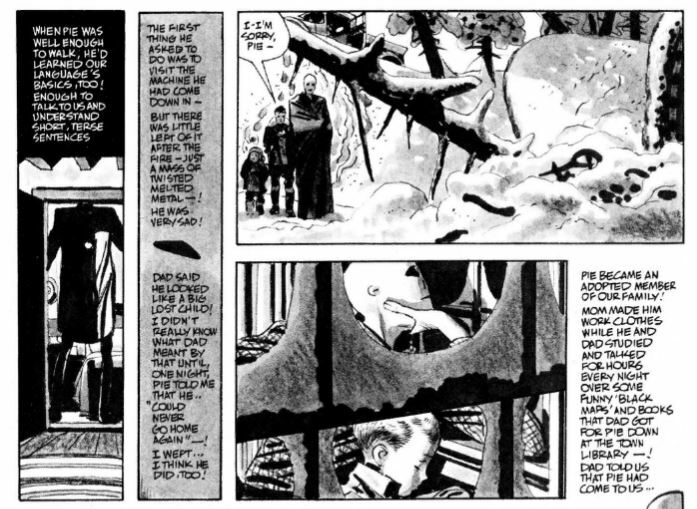 Toth’s Use of Frames in “Daddy and the Pie”: One of the things that made Toth a master (among many other skills) was his ability to frame action to highlight characters, similar to how cinematic masters such as Orson Welles and Alfred Hitchcock used frames to highlight their scenes. One night, Richard goes into town to get supplies, but is very late coming home. The family neighbor, Thatcher, informs them that the villagers had cornered Richard and were beating him up. Pie dons his flight suit and his “Gadget,” and goes to town to rescue his friend. 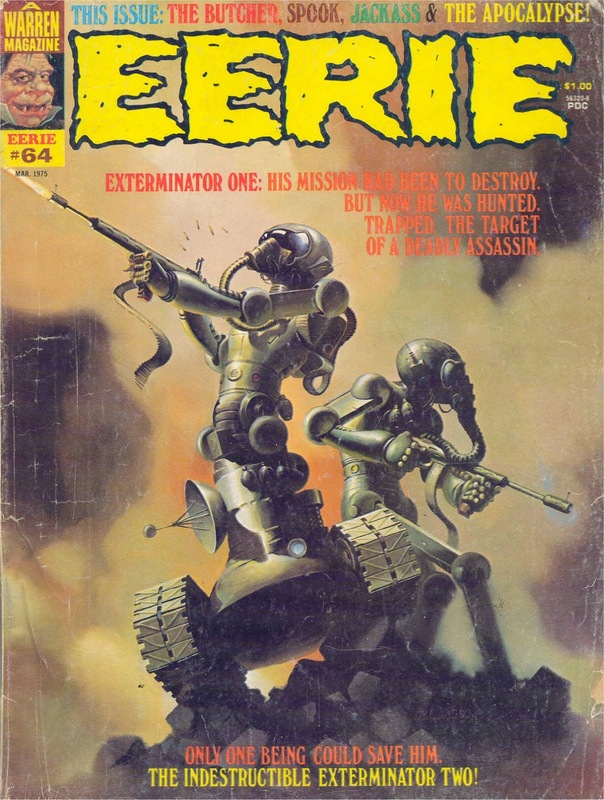 Eerie #72 (Feb. 1975): This eye-catching Eerie cover by the great Sanjulian certainly caught our eye, just in time for Christmas, too! Oddly, on the cover the story is titled, “The Pie and Eye.” We didn’t care. We bought it anyway! 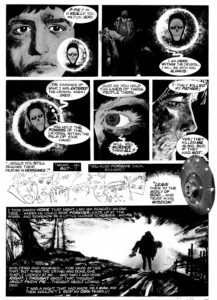 That next installment of Pie’s tale came almost a year later in Eerie #72 with “The Pie and I,” Budd Lewis now replacing Bill Dubay and Luis Bermejo taking over for Alex Toth. 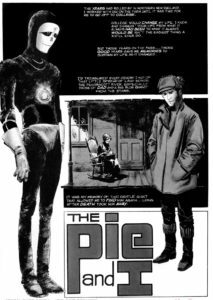 The First Page of “The Pie and I”: This was actually our first introduction to Warren’s super-hero alien, as we had missed Eerie #64 (that was life when you didn’t have a driver’s license!). The Harris family often remember their old friend Pie, and life goes on, even if Rich Jr. is frequently taunted for being a “Nazi lover,” for not signing up to go fight in the war. The tensions with the townsfolk of Stillwater come to a climax one Saturday morning when Rich Jr.’s father sends him into town to buy some pickets for a new fence. Despite his pain, Rich Jr. heads out immediately to help his father. However, since Richard Sr. had grabbed the family’s only gun, Rich has no weapons but one—he looks for a new weapon and opens the box in which he keeps Pie’s “Gadget,” places it around his neck, and goes to help his father. Rushing as quickly to town as he can, Rich hears hundreds of gunshots, but by the time he arrives, he finds his father sitting with his back against a turned-over truck, the back of his head blasted off where a bullet had exited his skull. 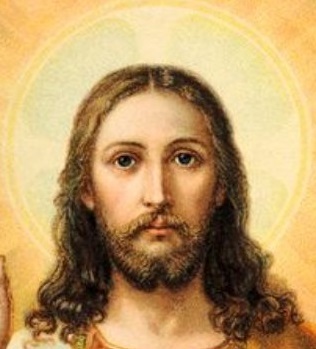 One might posit that Pie perhaps picked out from Richard’s thoughts ideas of a Christian God to calm Richard down. Perhaps. Yet textual analysis requires the reader to restrict oneself solely to the author’s words as a sign of his or her intent. Through the use of so many parallels and even the same wording as Mathew 28:20, Dubay and Lewis clearly signal their intent that Pie should be understood as a Christ-like figure. 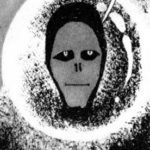 What or who Pie’s people in the far Cassiopeian system truly worshipped is besides the point, as the many parallels the writers introduced allow for no other interpretation. Like a Streak of Lightning from the Clear Blue Sky! At a very young age we were Marvelites (the entrenched heroes of the Distinguished Competition simply didn’t appeal to us!). 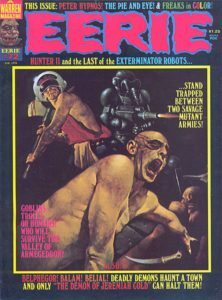 Yet the creations of Warren Publishing appealed to us just as much but were somewhat unobtainable (mostly due to the magazine’s higher price tag). It is difficult to describe just what kind of effect that this story had on our young minds, there in our boggy swamp abode, but to say inspiring as nothing before or since in the comic world, would be an understatement. First, predating E.T. : The Extraterrestrial by almost a full seven years, we had never encountered a goodly alien (not counting Super-Man, who looked human and spent nearly his whole life on Earth). This wasn’t the hostile aliens of H.G. Well’s War of the Worlds or Marvel’s Skrulls, or of Star Trek’s Klingons (or much later, Borg); here was a goodly alien, friendly and caring. 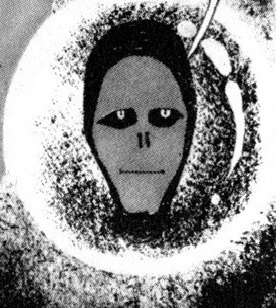 Pie was a breath of fresh air and a messenger of hope, hope that any alien race that exists and is so advanced so as to traverse the vast emptiness of space would have long ago overcome their baser instincts. Secondly, though we did indeed grow up with the Man’s dictum via Spider-Man that “With Great Power Comes Great Responsibility!”, never before (and never since, to be honest) were we encouraged by a comic-book hero to trust in the mercy and wisdom of God, a lesson straight from our weekly catechesis! We had never seen this before! It was simply unheard of! And we never forgot the story of Pie. 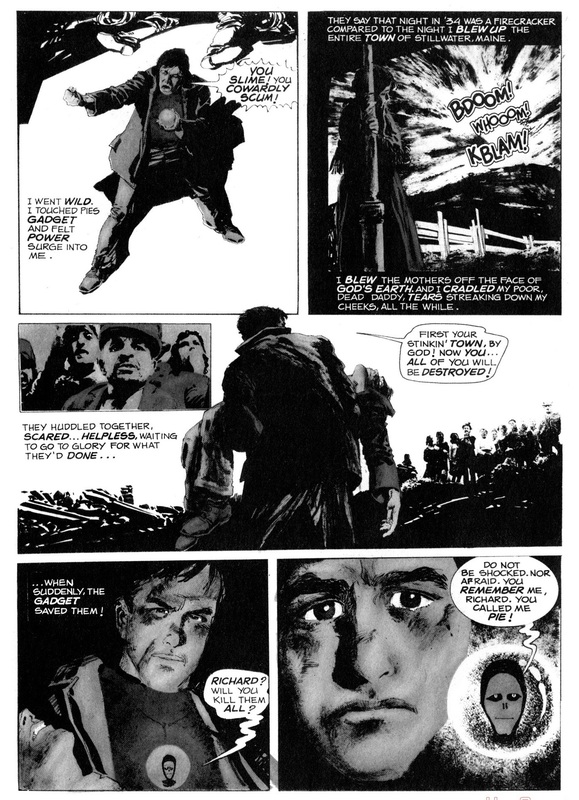 A Close-up of Bermejo’s Art: Using photo-realism, the reader gets a feel for the horror, terror, and tension of the tale’s climatic scene when Rich threatens to kill the people of Stillwater. Though some commentators have disparaged Luis Bermejo in comparison to Toth, we find such commentary to be unfair. It is like comparing other great artists: Of course, Bermejo’s work on the Pie lent the story a different look, a different feel, but that is not to say that it was in any way inferior—only different. The story of Pie, besides being a classic masterpiece due to its great writing and art, is a classic for its themes of hope, redemption, and forgiveness that the story underscores. Sadly, it is doubtful that such a story could be printed today, and the story of Pie has quietly fallen to the wayside—forgotten—much like its very creators as well as the marvelous company (no pun intended) that allowed for its creation (but that’s a tale for another day). 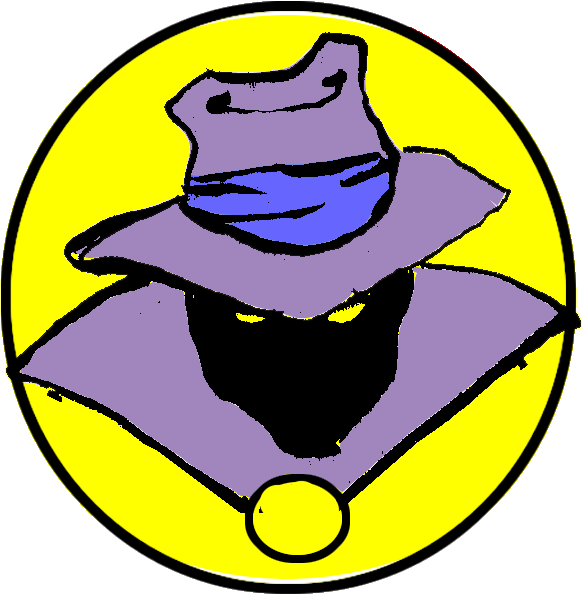 The Great Toth continued his legendary career at Warren and other companies. Bermejo went on to create his own wonderful rendition of the Lord of the Rings (El Señor de los Anillos) and later worked for Skorpio, Lanciostory, and Relatos Nuevo Mundo in Europe. After Warren’s demise in 1983, Dubay and Lewis moved west to Hollywood and found success there for some time, Dubay helping the Man found Marvel’s animation studio (Marvel Productions) and Lewis going on to write screenplays. Sadly, Lewis fell upon hard times in his final years, even manning a hot dog stand with his wife Grae to make ends meet. A great genius who was also humble, very much like his hero—The Pie.